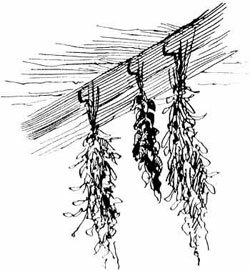 Three different herbs hung to dry in the rafters. Another of our copyright free, vintage images; this drawing make for a perfect addition to a visual project about cooking, gardening, or herbs themselves. Lucretia P. Hale (1820-1900) included this illustration in her work, The Peterkin Papers, 7th Edition which carried an original copyright date of 1880.